The Executive Board considered two measures Feb. 12 that would increase the level of legislative oversight of the state Department of Health and Human Services regarding children in the state’s child welfare and juvenile justice systems. Currently, all cases of death or serious injury of a child in a foster home, private agency, child care facility or other program licensed by DHHS must be reported to, and investigated by, the office of the inspector general of Nebraska child welfare. LB1078, introduced by Bellevue Sen. Sue Crawford, would add to that requirement all allegations of sexual abuse of a state ward or a juvenile on probation, in a detention facility or residential child-caring agency. Crawford said the bill was in response to a 2017 inspector general report that found 50 cases of child sexual abuse of children served by Nebraska’s child welfare and juvenile justice programs that were substantiated by DHHS or the court system. Of those cases, she said, 27 occurred while the child was in state care. In light of those findings, she said, the inspector general recommended that the department create a system to collect and review information about allegations of sexual abuse of children served by the state. Crawford said DHHS rejected the recommendation, claiming it already has an intake system that collects the information in question. However, DHHS could not immediately provide that information when asked for it by the inspector general, she said, adding that it is not a data point that is being properly collected and analyzed. “That means there is no quick and efficient way to pull information on the number of sexual abuse allegations made in a certain time period involving children in the state’s care,” Crawford said. • agency substantiations, court substantiations and court-pending status cases. Julie Rogers, inspector general of Nebraska child welfare, testified in support of the bill, saying it would increase transparency and accountability regarding allegations of sexual abuse of children in state care. She said her office’s recommendation to DHHS regarding tracking sexual abuse allegations would allow the state to monitor the issue, analyze trends and suggest system improvements. The 50 cases outlined in the report were not discovered by the department, she said. Juliet Summers of Voices for Children in Nebraska also supported the bill. Half of the children whose cases were outlined in the inspector general’s report were abused by caregivers, she said, and that number is “almost certainly an underrepresentation,” because child sexual abuse in general is underreported. “[The bill] would ensure that allegations of sexual abuse of children in care continue to be investigated and reported to the Legislature for appropriate further action,” Summers said. 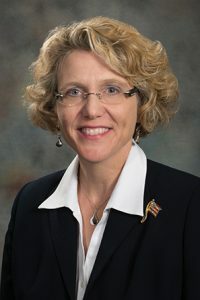 Also considered was LR288, sponsored by Lincoln Sen. Kate Bolz, which would create the Nebraska Child Welfare Death and Abuse Special Oversight Committee. She said the proposal also was in response to the inspector general’s report. An oversight committee could bring together stakeholders and be a catalyst for change, Bolz said. There are a number of legal requirements—including maximum caseloads—that the department currently is not abiding by, she said. “These are complex areas of law that aren’t working as they should and deserve a response for the safety and well-being of our kids,” Bolz said. • three members of the Legislature appointed by the Executive Board of the Legislative Council. The committee would be tasked with studying child deaths and abuse reports alleging harm to children in the care of DHHS and actions taken in response to those allegations. It also would examine the policies and procedures in place to ensure that the backgrounds of staff, parents, foster parents, kinship placements, guardians and other caregivers are sufficiently screened for any history of abuse. The committee would study staff training policies to assess and mitigate risks for abuse and the status of recommendations made by the office of inspector general of Nebraska child welfare. A report on these findings would be due to the Legislature by Dec. 15, 2018. The committee would continue its work until the beginning of the next legislative session. Sarah Helvey of Nebraska Appleseed testified in support of LR288, saying it would bring together expertise from several areas and establish a helpful structure within which the Legislature could study the issues of abuse and injury to children in state care. “The response in Nebraska to [these serious incidents] as investigated by the inspector general has not, to date, included comprehensive efforts to correct inadequate procedures and policies identified in the system,” Helvey said. Matt Wallen, director of the DHHS division of children and family services, opposed the bill. The department currently submits over 30 quarterly and annual reports to the Legislature, he said, and is subject to ongoing oversight by the federal government as well as the Legislature’s Health and Human Services and Appropriations committees. In addition, he said, DHHS has fully implemented more than 20 of the recommendations made by the inspector general’s office and is working on several others. “It is unclear why additional legislative oversight is needed,” Wallen said. The committee took no immediate action on either proposal.